Excellent, review. This one is on my do-want list. In dozens of reviews of this particular knife, there is only a single complaint about the knife itself. That is that the swedge does not allow for batoning. Most folks seem to share your views on the sheath. When I eventually get one of these, I might have to try to rig up a better kydex sheath. Thanks RK! Yeah, the swedge and the general shape of the blade make batoning difficult, but if you keep that in mind then I think it’s fine blade for hacking and chopping. I think this would be an excellent candidate for a custom sheath – I was almost going to suggest that in the review. It’s a really solid knife for the money and the inexpensive sheath means you have room to either make your own or buy a custom sheath. Very good reviews. I would like to suggest that you include a section on machete reviews. I lived in a village in the Pacific Islands, and I earned some of my college expense money woking on a road survey crew in Southeast Alaska. Both areas are rain forest, and any survival knife there must be able to cut through palm fronds or tree branches, clear a campsite of grass and clear a trail. A machete with a sheath and a blade short enough to carry on a belt is an important, even essential, tool in environments such as these. I have found inexpensive machetes such as Tramintina and Camillus to work quite well. You might perform a useful service by reviewing some of these tools that are the real “survival knioves” of people who live in those environments. Hi Faiaoga! Thanks for the excellent suggestion my friend! I have not reviewed many machetes at all, and you know what – I’d like to fix that. Down here in Florida a good machete comes in handy too so I’ll see what I can do about putting together a section on machete reviews. Thanks again! COULD NOT AGREE WITH YOU MORE, WITH THE CHOICE OF A KHUKURI. HOWEVER MY CHOICE WOULD BE MODEL K-1943, 12″ X 1/4″, CARBON STEEL BLADE GURKHA KHUKURI SOLD BY “WINDLASS STEEL-CRAFTS”. THE KNIFE & SHEATH WOULD BE HEAVILY MODIFIED TO INCREASE ITS UTILITARIAN PRACTICALITY & COMFORT. FOR SURE, A ZOMBIE KILLER OF THE HIGHEST ORDER—OOORAH. THANKS DAN. WOULD BE HAPPY TO SEND YOU SOME PICS OF SOME OF MY CUSTOM CONVERSIONS, TO BOTH KNIFE & SHEATH. WARNING: FREQUENT USE OF MIL-SPEC, CARBON STEEL, GURKHA KHUKURI’S IS HABIT-FORMING. THE ADDICTION IS VIRTUALLY IMPOSSIBLE TO RECOVER FROM!!!! Dan, Loved this review. Beautiful setting! Keep the reviews coming! Hey Dan, I am a big fan and I bought myself a Kukri after seeing this review! One of our tree’s lost a fairly large limb during this Hurricane Sandy and I thought I would see how the Kukri fared in chopping. Long story short it was excellent but I would probably want to use something more dedicated for heavy cutting – like a chainsaw 🙂 But nevertheless good to know Ka-Bar can step up when I need it to! Another note, I saw in your video that you have a Cold Steel SRK . . . could you do a review on that one? I have been considering it for a relatively inexpensive fixed camping knife and would be very interested in seeing your thoughts on the SRK. Absolutely, I would love to do a review on the SRK and have been meaning to for some time now. For whatever reason it keeps falling through the cracks – I’ve owned the knife for well over a year. I’ve got a number of fixed blades to review so I will put them to work and get on it. Thanks for dropping by – I hope you were not severely effected by the storm. Stay safe and thanks again. I was reading your review of this blade, nodding my head in agreement until I read, “Your average machete would break in two if you tried to do half the stuff this knife is capable of (like chopping through 8″ diameter trees).” Here, I have to disagree. Check out colhane and jeepzillajoe on youtube to see what machetes can do. Real machetes (not those walmart ozark trail, coleman and coghlan things) are capable of a whole lot more than you’re giving them credit for. They can be used to chop and split wood. Chopping through 8″ diameter trees might take a bit longer with a machete than a large knife like the Ka-bar kukri, but it’s not going to break in half doing it. 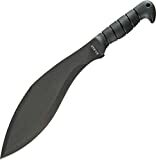 In fact, with a machete that has a wider blade, like a bolo or a cane machete, I’d bet it could keep up with the ka-bar kukri in the hands of someone who knows how to chop with a machete. As for real khukuris, on bladeforums and other knife forums, the recommendations are usually for Himalayan Imports (U.S.-owned company that employs kamis in Nepal), Tora Blades (U.K.-based) or Khukuri house (which seems to be based in Nepal; known for low prices, but expensive shipping). Windlass Steelcrafts is a manufacturer based in India and the opinion of their products seems to be so-so and their kukris apparently come dull. Thanks Chris, I appreciate your comment and you make a great point. I think we have just a misunderstanding of semantics here as I am in total agreement with you. When I wrote “average machete” I was referring to the cheap yard dogs you may find for $10 at Wal-Mart – really cheap stuff from Gerber, Coleman, etc – not a nice Himalayan Import or Windlass machete. Cold Steel and Ka-Bar also make nice heavy duty machetes that could chop (maybe not as well as the Kukri, but well enough). Sorry for the misunderstanding. I’ll try to clarify the language when I get a little time! I BROUGHT A BOLO BACK FROM THE FILIPINES 20 YRS. Ago, and it looks exactly like your piece. Maybe heavier. I haven’t used it to cut anything. But it will go in my buyout bag. Cool, Eric! If it is anything like the Kurki Machete it’s a serviceable tool. Thanks for sharing! I have this blade myself (KA-BAR Kukri) and it is by far my favorite one! I use it for practically everything I need to do that doesn’t need an axe. In many ways, is practically a bladed hatchet, its that sturdy; that said if I need my hatchet, I’ll use my hatchet. It was functionally sharp from the factory, but I was really impressed at how after a few sharpening sessions with a sharpening “puck” (mainly used for axes; one side is coarse, other side is fine) how sharp it has become. I can usually take out 1-1.5 inch green juniper/cedar branches in a single blow, if I watch my striking angle…with proper blow placement I’ve cut thru 3-4 inch limbs in under a minute or so. This my go-to blade of choice for everything that doesn’t require an axe, hatchet or chainsaw…it will definitely be in my hand if I ever have to grab my Bug Out Bag! I am glad I am not the only one who likes this Kukri Machete. It’s an alarmingly effective tool, and as you pointed out, it sharpens up real easy. Cheers!